by Eleni Mendoni (click here for Eleni’s biography). The goal of the studio is to provide to its members comfort and safety, whilst in a fun and professional environment. Arrangements are made so that each lesson accommodates only a small number of students in each class, giving the chance to each student to have the appropriate attention from his/her trainer. 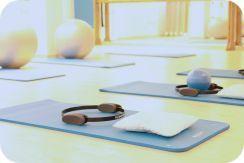 The studio also gives the option to its members to choose lessons according to their preference. Each member can choose their own combination of lessons according to their physical condition and age, and with the right guidance from the management they can choose lessons which represents their needs. Each member can choose and combine several classes after a personal consultation with the management. Three soundproofed classrooms with a dividing monorail door. State of the art overhead sound system with multimedia capabilities. 24 Individual Lockers with personal keys. Separate Changing Rooms,WC and Shower Facilities for Men and Women. Reception Area with Water Cooler.